Inspired by the professional illuminating techniques and expertise of its makeup artists, Dior invents Diorskin Star, its 1st brightening foundation: a weightless fluid capable of recreating the spectacular and perfecting light of Dior's studios. - The complexion is instantly more luminous and visibly more even. A new generation of hollow silica beads captures and diffuses light in a correcting halo with no shine. At the same time, colour-filter pigments neutralise colour imbalances to recreate the perfect light. - The complexion is clarified with a purer, more dazzling and long-lasting light. Anti-"light-trap" skincare ingredients help reduce the appearance of dark areas, pigment spots and redness. 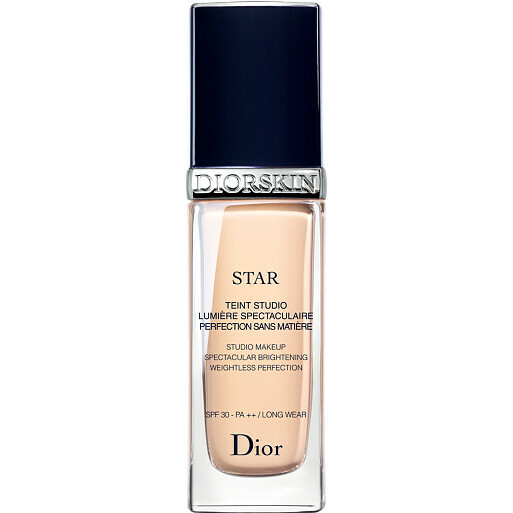 DIOR Diorskin Star Studio Makeup SPF 30 - PA ++ is rated 4.7 out of 5 by 18. Rated 5 out of 5 by Juju62 from Fantastic foundation Have used this foundation before but then went onto others but this is far and away the best foundation I have used.its more expensive than some high street foundations but it's worth every penny,last for ages and the coverage is very good.also it was discounted when I bought it so that was an added bonus,would still buy again at full price because it's worth it to me. Rated 5 out of 5 by QueenSakina from Love this foundation! It's so difficult as a fair indian girl to find a foundation that matches my skin tone without making me look ghost-like or too yellow! Thank you very much Dior for your gorgeous gorgeous product! #LifeSaver I love this foundation because it matches my skin beautifully whilst giving me a nice radiant gently illuminated glow. It looks very natural and it feels so lightweight. It reminds me of YSL Touche Eclat, however I find that Dior really has the edge. Rated 5 out of 5 by Luscious from Diorskin Star is A list quality! After getting colour matched to shade 050 at the Dior counter in Selfridges, I used my sample pot for the week & was highly impressed. The foundation requires swift application, as it does have a tendency to dry & set quite quickly. So, apply with fingers, beauty blender or your favourite brush & then work it quickly to achieve even coverage. Just ensure face is moisturised/primed before application. The foundation itself is weightless & provides medium to full coverage. You can easily build to add more coverage should you wish, as there's no cakey feeling to the foundation. I can apply this foundation in the morning (about 6am) and it will last a full day at work (finishing at 5pm) with no need for me to touch up. I don't use this foundation with powder either. After a spritz of setting spray (MAC fix plus or Urban Decay All Nighter) the finished application is flawless. This is my first time trying a Dior foundation and I can highly recommend Diorskin Star!